PA chairman makes clear the Palestinians will continue to oppose President Trump's "Deal of the Century". Speaking at a meeting with members of the new cabinet headed by Mohammad Shtayyeh, Abbas predicted that in the end, "nothing will remain of it (the Deal of the Century) and there will be no announcement about it." 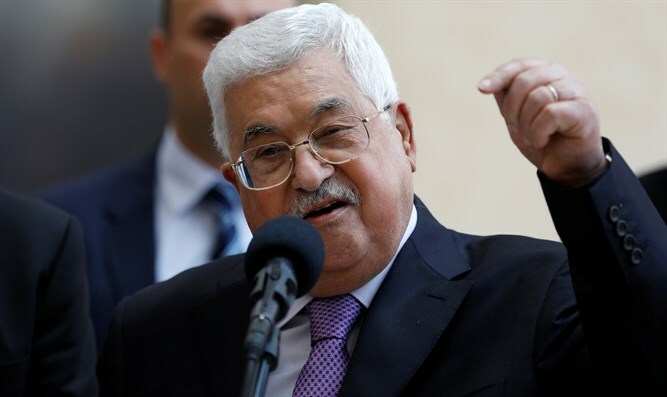 "We have opposed this deal all along because it took Al-Quds out of Palestine, so we did not want the rest of the plan because there is no state without Al-Quds, and there will not be a state in Gaza nor a state without Gaza," Abbas stated. "Why does President Trump want to talk about any solution or any issue after he transferred the embassy to Al-Quds and recognized Al-Quds as the capital of Israel? Therefore, I do not think there is any point in having a dialogue with him," added the PA chairman. Abbas has rejected the US peace plan being formulated by the Trump administration before it has even been unveiled and has been boycotting US officials ever since Trump recognized Jerusalem as Israel’s capital in December of 2017. Aides to Trump said last week they expect the president to release his peace plan once Prime Minister Binyamin Netanyahu forms a coalition. They added that despite criticism of the administration’s moves to date, the plan will demand compromises from both sides. The contents of the Middle East peace plan, authored by President Donald Trump’s advisers Jared Kushner and Jason Greenblatt, have remained a secret thus far, though Kushner recently discussed it in an interview with Sky News in Arabic.